In this session, participants will explore the ways in which systems of oppression, specifically white supremacy and racism, are built into our policies and procedures. 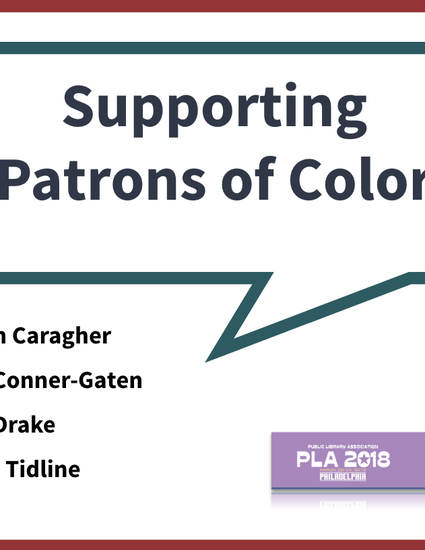 We will examine the ways in which they contribute to systemic racism and harm patrons of color. Participants will learn to diffuse difficult situations, reflect on their privileges and biases that escalate situations, and work together to come up with anti-racist strategies to move towards racial equity in our institutions. 1: Have a clear grasp of why it is important to embrace inclusion and to implement anti-racist strategies in their library and in their work. 2: Gain a vocabulary and framework to use as a building block for understanding ally work as a social justice value for library work. 3: Develop methods of engagement that are responsive to their communities throughout the year, not just in "special months"